It’s hard to believe that the James Bond series is 50 years old now. 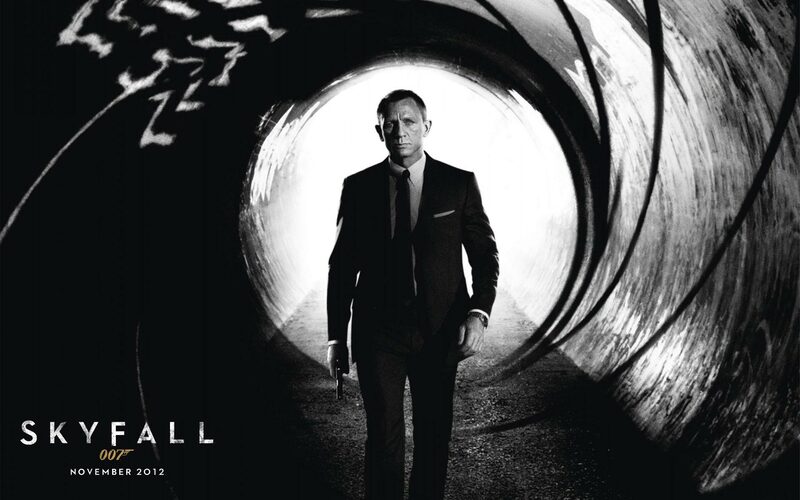 Don’t let the age fool you, because with the latest installment of Bond, ‘Skyfall’ might just be the best one yet. Action-packed with giant set pieces, bits of humor, one of the best villains in Bond history, and one hell of an homage to the original Bond should make ‘Skyfall’ and instant classic and fan favorite of the 007 franchise. It’s been a few years since the last Bond film, ‘Quantum of Solace’, and I imagine most of you were anxiously awaiting a third film since ‘Quantum of Solace’ was okay at best. At least for me, I wanted to see if 007 had run its course and if Daniel Craig was still up to the job. Let me assure you, that Craig has not lost a step and director Sam Mendes (‘American Beauty’) and cinematographer Roger Deakins (‘Shawshank Redemption’) provide a new and fresh take on this classic series. I for one want Deakins and Mendes to make the next film. The reboot of 007 with ‘Casino Royale’ was top notch. It brought a new generation of Bond to audiences, a Bond that most everyone enjoyed. It was packed with great characters, big explosions and action sequences, and great storytelling. However, with this ‘Skyfall’, while it’s the same Bond, it feels like a deeper and more complex version of 007 than we have ever seen before. 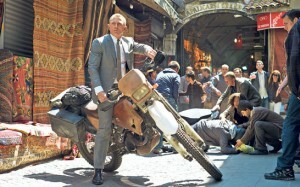 Bond isn’t the only focus in ‘Skyfall’ this time. M (Judi Dench) is also a central focus this time around, and while we still have an out-of this-world, homicidal villain, it seems like it is much more realistic than the previous films as ‘Skyfall’ dives into cyber warfare and terrorism, very real world problems. Bond himself seems to be a mere mortal this time around too. The past Bonds before Craig seemed to not get a scratch on them and always look their best while fighting in the dirtiest of places. But when Craig took on the role, we saw him get beat up, scratched up and close to death. ‘Skyfall’ takes it to the next level as we see Bond age and have a little bit of trouble getting around. Even the opening credits suggest his death with tombstones and blood as we see Bond fall several stories to his doom under water. Don’t worry, this happens in the first few minutes of ‘Skyfall’ after a thrilling chase sequence in cars, roof tops, and on top of a train. After the opening credit sequence with the hit song by ‘Adele’, we see M writing the obituary for her fallen 007 agent. But don’t fret, Bond survived and has been taking a long needed vacation by hiding out remotely on a tropical beach unknown to anyone. Meanwhile, in London, MI6 headquarters is attacked and explodes in flames, killing a bunch of people. Within 24 hours, Bond is back in London ready to get back to business. Bond is greeted by M and MI6’s new boss Gareth Mallory (Ralph Fiennes), who seems to not be a fan of M or Bond. During the explosion, all of the British agents along with others who were undercover in terrorist organizations were comprised and stolen to be released publicly, which are leading to a lot of agents being killed and making M look like she doesn’t have control over her agency. At MI6’s new headquarters, Bond is subjected to tests which consist of physical and mental examinations to see if he is fit for active field duty, which proves more difficult than you would assume. From here, Bond travels to beautiful and mysterious Shanghai where he of course is in a tuxedo and orders a martini that is shaken by the bartender. I got a bit gitty here, since Bond is in a casino again and meets a woman who is supposed to take him to the person who is causing all of this terrorism. She leads Bond to a deserted island, which seems at one point was highly populate by giant buildings and commerce. Bond is separated from the girl who led him there and is tied down to a chair in a room with tons of computer servers are stacked to the ceiling. 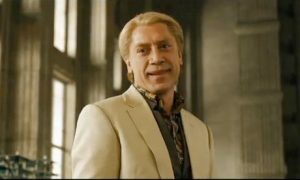 Here is where we meet Silva (Javier Bardem), the master villain in bleach blond hair and who has an affinity for muscular men. Silva is a mixed bag of pretty boy meets psychotic maniac meets salesman and might just have one of the greatest entrances and opening monologues in recent memory. Too bad Silva is not introduced until over an hour into the film. However, British intelligence arrive at the scene and take Silva as their prisoner, almost too easily, but just like any Bond villain or The Joker, they always have a plan. Silva escapes from capture and reforms a small army to take out Bond and M by any means necessary. This is where things jump to next level. Without the use of the high tech gadgets that we are so accustomed to in the Bond films, 007 takes M to his old family house in the country where he sets up to fight Silva and his army with a couple of old guns and a stick of dynamite. ‘Skyfall’ is my favorite Bond film to date. Everything about is done so well. The new Q (Ben Whishaw) was particularly fun and great as he is a young man who is a full on geek like myself. He handles Bond very well and is quite comedic, but not overly done. I can’t wait to see more of the new Q. Thomas Newman’s score is also incredible as it fits every scenario and blends in well with the iconic 007 theme. And Craig himself was born to play Bond. He just owns this role and hope he commits to Bond for a few more films. This installment of the 007 franchise is my favorite and might be the best one yet. This entry was posted on Thursday, November 8th, 2012 at 12:25 am	and is filed under Film, News. You can follow any responses to this entry through the RSS 2.0 feed. You can skip to the end and leave a response. Pinging is currently not allowed.